Youthful eyes are almond shaped and slightly up-tilting on their outer aspect. As one ages and tissues lose their tautness, the skin and eyelid structures start to drop and ‘sag’, producing deepened wrinkles, excess skin folds and bulging. 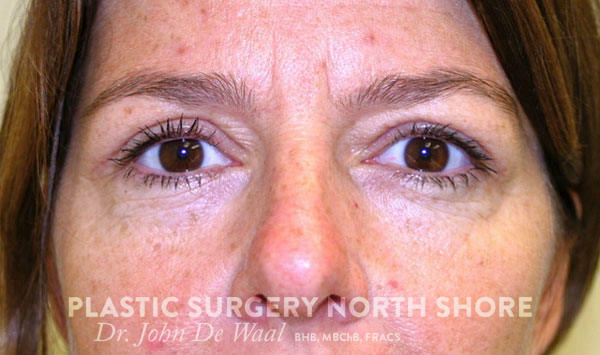 A so called ‘blepharoplasty’ addresses the problem of ‘baggy eyelids’. Additionally – the upper eyelids are a continuum of the brow. A heavy brow flattens the eyebrow which in turn puts even more skin onto the upper eyelid. The lower eyelid is in continuity with the cheek. As the cheeks fall they drag the lower eyelids with them so lengthening the lower eyelid. Each case then is potentially unique and careful evaluation is needed to consider what components need correcting in an individual to give the best result. The upper eyelids and lower eyelids can be operated on separately or both together. This can be done under a local or general anaesthetic. If just the upper eyelids are being operated on this is usually performed under a local anaesthetic only. A cut is made across the shadow area of the upper eyelid. Extra skin and any bulky muscle is removed, any bulging fat esp. 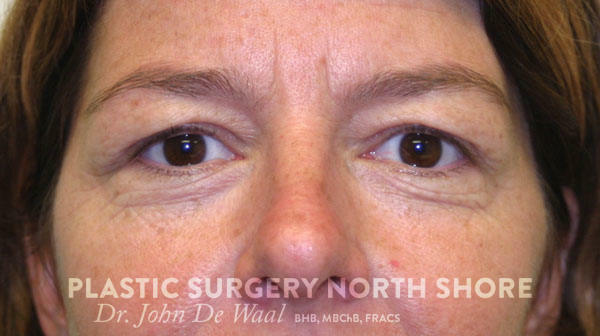 in the inner corner is removed and the normal attachment of skin to muscle is resecured. The skin is then stitched closed. For a full blepharoplasty i.e. upper and lower eyelids or lower eyelids alone – a general anaesthetic is not uncommon, although local anaesthetic is still more usual. In lower eyelid surgery cuts are made beneath the lashes of lower eyelids and tissue resuspended and excess removed. Fat bulging deep to this tissue was traditionally removed but is now more commonly repositioned. If necessary the lower eyelid muscle is tightened. Excess skin is removed. The cuts in the eyelids generally heal exceptionally well and once healed are difficult to detect even on close inspection. Bruising and swelling reach a peak at about 24-36 hours and thereafter subside. You should expect to take things fairly quietly for the first 48 hours (i.e. sit or lie head up) to minimise swelling. It generally takes about 7 days for this to settle and a little swelling or discolouration may persist in the lower eyelid for a further week. Sutures are removed at 4-7 days. Bruising and swelling is to be expected and can range from almost non-existant to quite marked. Sometimes not enough tissue is removed and a little extra is required to achieve the desired cosmetic effect. Scars can sometimes be irritating for a while. Eye irritation, esp. if one has a tendency to dry or irritated eyes before the procedure, can be exacerbated. Contact us via the web-form or call 09 486 1190 for the latest cost estimate.